This is a sort of a sub-problem of the open puzzle Peaceful Encampments, for high numbers of armies. Consider the upper-left image here. Scan it from left to right; you encounter the armies in the order "G-R-B-M-C-Y". Scan it from top to bottom: "M-R-G-Y-C-B". Scan it backslashwards from upper left to lower right: "G-R-M-B-C-Y". Scan it slashwards from lower left to upper right: "B-G-R-C-Y-M". Upper left: GRBMCY MRGYCB GRMBCY BGRCYM. 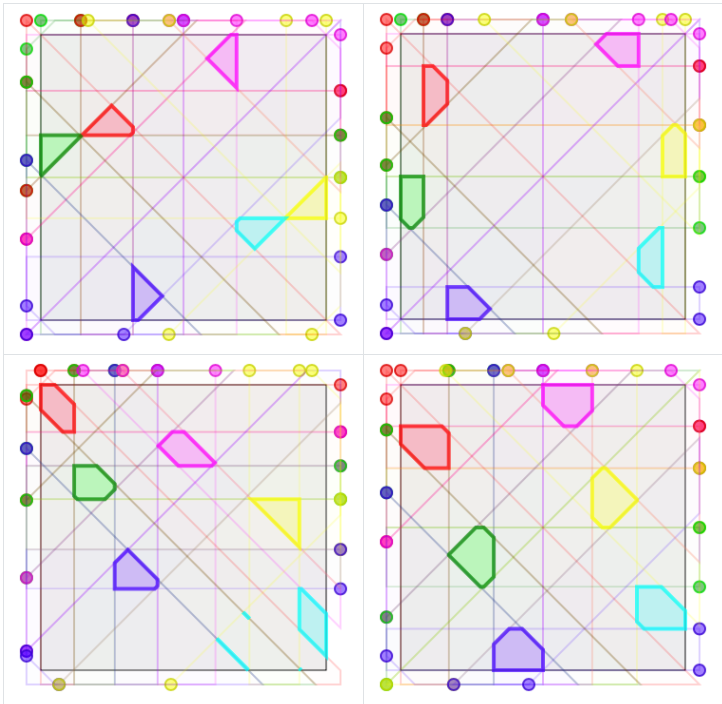 Upper right: GRBMCY MRYGCB RGMBYC BGRCYM. Lower left: RGBMYC RMGYBC RGMBYC BGRCMY. Lower right: RGBMYC MRYGCB RMGYBC BGRCYM. How many different ways are there to arrange six armies on the board? Upper left: RGBCMY CGRYMB RGCBMY BRGMYC. Upper right: RGBCMY CGYRMB GRCBYM BRGMYC. Lower left: RGBCMY RCGMBY RGCBMY BGRYCM. Lower right: RGBCMY CRMGYB RCGMBY BGRYMC. RGBCMY RGBCMY RGBCMY RGBCMY (the "simple" solution). 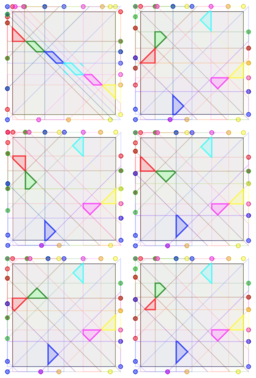 Preface: As this is primarily an exercise in counting, and not a puzzle per se, there are no spoiler tags in this post, which aims to provide a method for counting the number of distinct arrangements of six camps. My initial comments, which prompted an edit to the question, have been removed. For each unique solution found in the first step, we need to find the number of ways the camps can be ordered along the diagonals. We do this by passing a diagonal line across the field, noting the order in which the camps are encountered. 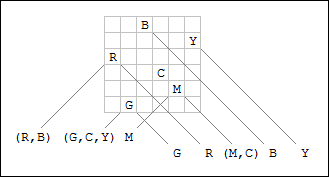 For this first example, there is a unique ordering along each diagonal, giving exactly one solution for this arrangement. 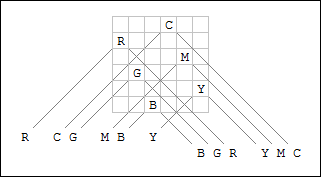 This arrangement has multiple camps on the same diagonal, and these camps can be encountered in any order. For example, we could have RBGYCM-GRMCBY or BRCYGM-GRCMBY. For the order along the downward diagonal, (R,B),(G,C,Y),M gives us $2!\cdot3!\cdot1=12$ possible orders, while G,R,(C,M),B,Y gives us $2$ orders along the upward diagonal. This gives us a combined $24$ possible orders along the diagonals, but the inherent symmetry of this arrangement means that only $12$ of these are distinct. 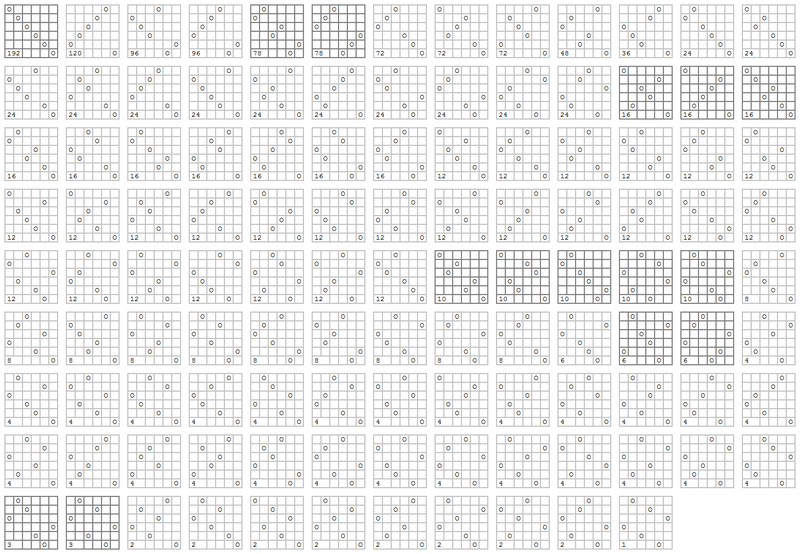 Solving the first step (the non-attacking rooks) is simple (there are 115 distinct solutions), but determining the number of unique solutions overall requires more work. There are a total of 1999 distinct camp arrangements. Previous counting errors have been corrected. The image below shows each of the 115 base arrangements, along with the number of distinct camp arrangements associated with each. The arrangements with the darker border have rotational symmetry which has been specifically accounted for. The others are counted using only the method described above, taking into account the mirror symmetry where applicable. Note that while the arrangements are distinct, some have only trivial variations (such as those I previously mentioned) that will not affect the size of the camps. I note that the "peaceful encampments" aspect can be trivially ignored for the question here. There's no reason why we'd have to make any of them larger than a point. (Or, alternately, we can solve for point-source armies, and then trivially expand into available space as necessary). Thus, any arrangement of right-to-left can go with any arrangement of top-to-bottom. My intuition is that the first diagonal can be ordered at will so long as (A is down from B) and (A is left of B) always implies (A is diagonally down/left of B). The second diagonal has that limit, but my intuition is that there is also a further limit based on the first diagonal on combination with the top-to-bottom and right-to-left status. start with a set of six points. each point has an X and a Y.
Label the points A through F, ordered by X coord. how many distinct ordering sets are there? I'm not sure if there is a further constraint beyond that. if ord(X) == ord(Y) then ord(X+Y) is fully constrained, and ord(X-Y) is fully unconstrained. The opposite occurs if ord(X) is the inverse of ord(Y). I m unclear about the non-degenerate cases, though. Not the answer you're looking for? Browse other questions tagged geometry combinatorics chess or ask your own question.